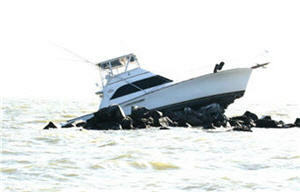 On Saturday Sept 29 a 48 foot ocean yacht ran full steam into a rock pile that was an old lighthouse. Hampton Fire Marine 5 (MetalCraft hull 446) and Fire Marine 2 responded. It was around 9 p.m. when station 5 heard the mayday call while monitoring the VHF radio. Sea state was 3 to 4 foot with a sustained wind of 15 knots. Fire Marine 5 held on station and rescued 6 people and one K-9 using rescue lines techniques. The recovery of the victims was done within 15 feet of the rock pile in the pounding surf. Each victim was rescued and pulled through the dive / personnel recovery door. During the rescue Fire Marine 5 kept 6 or more inches of water on deck but never faltered in maneuverability or stability. 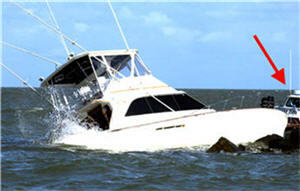 The vessel again performed superbly and assisted in the rescue and saving of 6 souls and 1 pooch. In addition it provided a safe platform for the rescuers. This is just another example of the professionalism of the Hampton Division of Fire and Rescue Marine Emergency Response Unit operating on a MetalCraft Marine vessel.